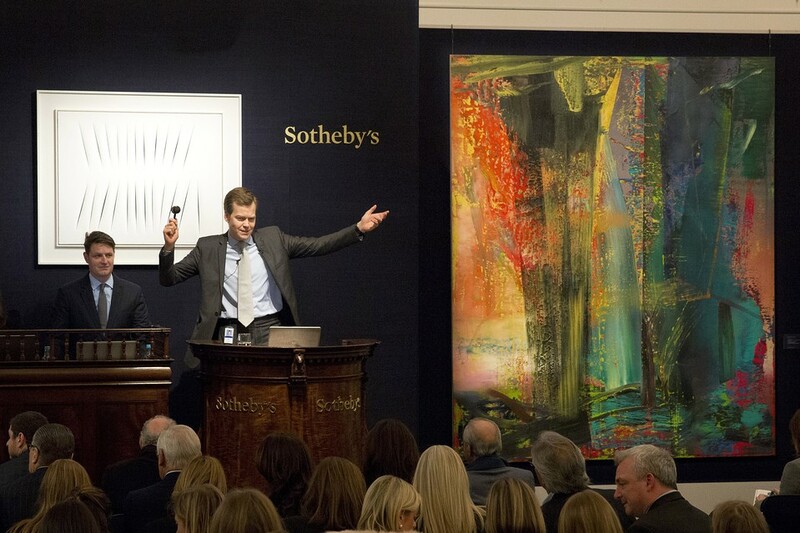 LONDON— Sotheby’s shook off doubts stemming from the ouster of its chief executive late last year, earning this past week its highest total for artwork auctioned in London from its contemporary art department. The company’s annual February auction Tuesday totaled $188 million, representing a 31% increase from 2014’s February sale. In November, William Ruprecht stepped down as Sotheby’s CEO, following a monthslong campaign by hedge-fund activist Dan Loeb to shake up the company’s management. Mr. Ruprecht’s handling of the contemporary art division was a focus of criticism. On Friday, Sotheby’s said it wouldn’t be paying a special dividend initiated last year, saying it wanted to preserve “flexibility” in its “capital allocation” while searching for a new chief executive. Tuesday’s auction result, within Sotheby’s $136 million to $193 million pre-sale estimate, helped the publicly traded auction house beat privately owned nemesis Christie’s, which sold $178 million worth of art on Wednesday, down 16% from a year earlier. Asian and Middle Eastern participation in Sotheby’s evening session on Tuesday was low, with only 9% of buyers from that region. But South American participation doubled from last year, with 37% of buyers coming from South and North America combined. At Christie’s, about a fifth of buyers were from Asia and the Middle East, with Europe and North America accounting for about half. The week’s biggest art sale was Gerhard Richter’s 1986 painting “Abstract Picture, 599.” It sold over the phone to Ken Griffin, founder of investment fund Citadel, at Sotheby’s for $46 million, according to people familiar with the matter. The purchase was highly unusual for the billionaire, better known for collecting more mainstream artwork, including Impressionists. Mr. Griffin broke the previous Richter record of $37 million set by Sotheby’s in May 2013. The 118-inch by 99-inch work, featuring a metallic-looking paint that glistens, drew its second-highest bid from a private collector working through Gallus Pesendorfer, a Cologne-based specialist who typically works with German buyers.